Helen North supported generations of students. 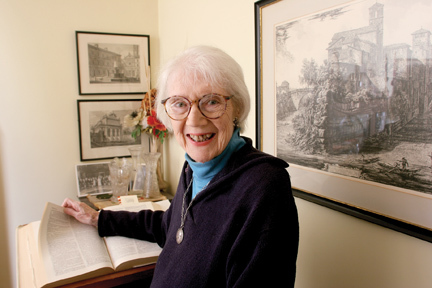 The campus community was saddened by the death of Centennial Professor Emerita of Classics Helen North, on Jan. 21. 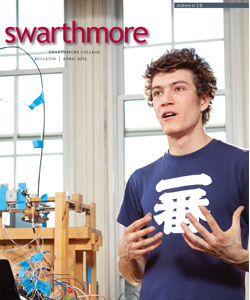 More than just a brilliant scholar and teacher, North cultivated relationships among Swarthmore students for more than 60 years. Gentle and gracious, with a robust and ready sense of humor, she was fiercely and firmly committed to intellectual excellence and the highest ethical standards. Her students loved her for these characteristics and because she so successfully modeled for them the joy in living the life of the mind. North joined Swarthmore’s faculty in 1948, and although the College served as her longtime home, she also held visiting teaching appointments at several institutions, including Cornell University, where she had earned undergraduate and graduate degrees. She also served as Classicist-in-Residence at the American Academy in Rome and held two teaching and research posts at the American School of Classical Studies in Athens. North received many major academic awards to support her scholarly work, including fellowships from the National Endowment for the Humanities, Fulbright Program, Ford Foundation, National Humanities Center, and the Guggenheim Foundation. A prolific writer, she was the author of Sophrosyne: Self-Knowledge and Self-Restraint in Greek Literature (1966), her first book and a still much-cited work for which she received the Goodwin Award of the American Philological Association in 1969. North is also the author of From Myth to Icon: Reflections of Greek Ethical Doctrine in Greek Literature and Art (1979), in addition to dozens of articles and reports in classical and professional publications. For her years of service, she received the American Philological Association’s Distinguished Service Medal and the Centennial Medal of the American Academy in Rome as well as honorary doctorates from Trinity College in Dublin, Fordham University, Yale University, and La Salle University, where she was a longtime trustee.